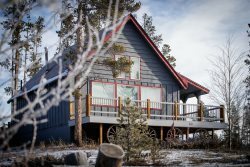 Cozy up under a wool blanket with a cup of hot cocoa and take in the scenic views of the Tenmile Range and Continental Divide on a sleigh ride through snowy Breckenridge. Weather permitting, sleigh rides generally run from Thanksgiving through mid-April and run for 35-45 minutes. Guests also have the option to stay after the sleigh ride for a buffet-style meal with live entertainment at the lodge. Take a sleigh ride at the Breckenridge Golf Club with views of the Tenmile Range and Continental Divide. Hot cocoa is provided before the ride. Private rides are available for an additional $150 to your total bill. Sales tax of 8.275% applies to the meal portion of the total bill. Groupons are accepted at this location! Colorado is known for its natural beauty, whether the mountains, valleys or wide-open spaces. This natural beauty has inspired residents and lawmakers alike to live and work in a way that often aims to protect these natural resources.